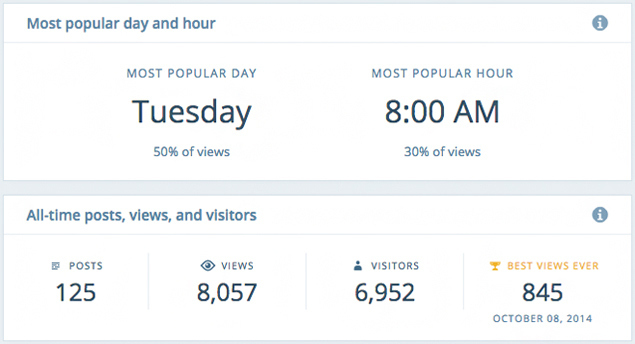 WordPress is introducing more powerful analytics with a new tool called Insights. The main new feature is the ability to tell you what times and days your website is most popular, for example 9:00AM and Tuesdays. One neat tool for independent publishers is the Posting Activity visualization, a sort of calender infographic describing the days you post most frequently. The deeper the blue, the more often you’ve posted. Meawhile, your old stats such as Comments, Followers, Tags & Categories and Publicize have also moved to the new insight page. Although other services already provide these sort of analytics, it’s nice to see WordPess adding it by default – it could remove the need for a plug-in, at least.